Confucius say, 'Double entendre.' You decide which one is the most appropriate. 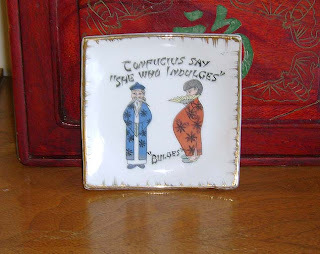 I read in Wikipedia that Confucius, as a chid, placed ritual vases on the sacrifice table. I wonder if he was responsible for emptying the ashtrays. I love the saying on that. I just got done posting about the dinner I made last night. The bulge comes later, I guess!